Contrary to popular belief, Cannabis was not outlawed outright in 1937. 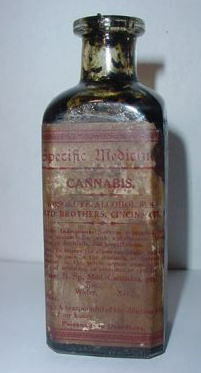 This bottle of tincture Cannabis, sold by the Lloyd Brothers Co., from 1880 to 1941 is proof that NOT all pharmaceutical manufacturers stopped making/marketing Cannabis products in 1937. And thus its rapid decline started. However, contrary to popular belief, at least technically, it wasn't until 1970 that Medical Cannabis was officially outlawed. And then only in the United States. As can be observed from notices in the American Druggist Blue Book [a pharmaceutical trade publication], Cannabis in both it's Bulk and Powdered forms was being sold to Druggists, well after the passage of the M.T.A. As seen in the Elmer & Amend Co.  price and product catalog, the price of a vial of Cannabinon tablets was 40 cents in 1939. However, it is unknown if the M.T.A. tax would be added later. It is interesting to note (with more than just a little irony here) that the M.T.A. and the paper-work that it generated can/is now being used by antique collectors to actually pin-point and locate Cannabis antiques. As an example, tax records now show that in 1938 there were 40 manufacturers of Cannabis/Hemp products in the State of New Jersey alone.